Knowledge and innovation are well and good, but what use are they if only kept amongst elite professionals and the rest of society are ignorant and falling behind? After all, we’re only as strong as our weakest link. It’s easy to get carried away by fantastical innovations and forget about the marginalised who may not have the luxury of benefitting from certain technological advancements or revolutionary ideas. 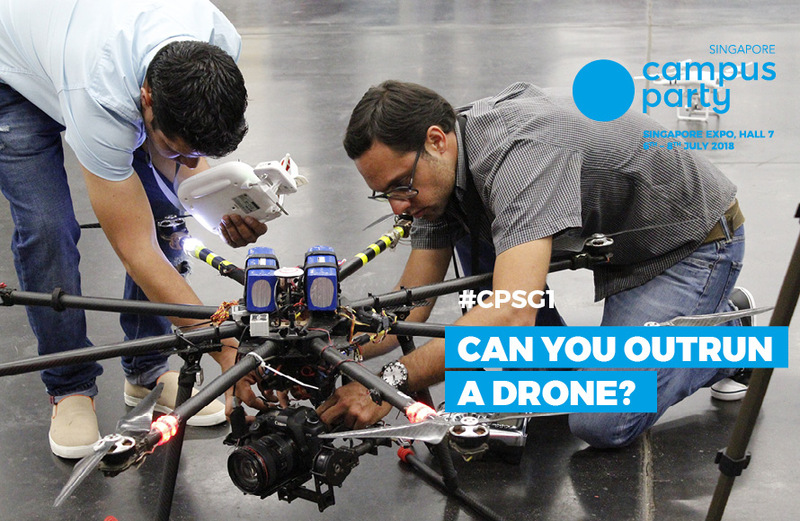 Well, Campus Party (CP) seeks to address your social concerns by inviting professionals who are not just operating their business under the giant umbrella of technology, but also in the name of social inclusivity. Many of the experts whom you’ll be hearing from have incorporated some element of social innovation into their business. From empowering women in Small and Medium Enterprises to inventing a fully solar powered cooking stove, these speakers will leave you feeling awe-struck by their myriad of intriguing ideas and inspire you to take that one crucial step towards the social cause you have always felt strongly about. Not all heroes wear capes, and these Campuseros will show you how you can be one too! If you feel that you’re too ill-equipped for your innovation efforts to amount to anything, Anthea Ong’s success story will challenge your pessimism. She has faced more than a few hard knocks in life: a devastating divorce, a stroke of financial misfortune and an identity crisis. But this determined individual goes on to embark on a series of journeys– such as a month-long expedition to Antarctica to raise awareness for climate change in the South Pole– eventually emerging victorious as a successful businesswoman with multiple social enterprises under her belt. But what really led her to develop such a heart for social innovation came from a place of personal hurt and experience. Growing up with a squint rendered her the victim of much ridicule even from her own family, fuelling her crippling insecurities. It was thanks to Anthea’s self-discovery journey that culminated in self-love which compelled her to help others with disabilities lead fuller lives. She owns a studio where she helps the hard of hearing to maximise their potential through yoga and meditation– the very activities which helped soothe her emotional turmoil and find a renewed sense of purpose in life. Does your heart ache for the children who may never be able to go to school due to the unfortunate circumstances that they’ve been born into? Wahana Visi (WVI) hopes to partner with people who share such a sentiment for children living in poverty in Indonesia. As a Christian humanitarian social organization working to bring sustainable transformation in the life of children, families, and community living in poverty, WVI dedicates itself to aiding the most vulnerable communities regardless of race, religion or gender–synonymous with the theme of social inclusivity CP strives to promote. For the past two decades, millions of children in Indonesia have benefitted greatly from WVI assisted programs. “Our vision for every child, life in all its fullness. Our prayer for every heart, the will to make it so”: if their slogan resonates with you, don’t miss this chance to be a part of something notable! If you’re a youth with a heart for entrepreneurship and a determination to change the world, Young Sustainable Impact (YSI) is here to help you achieve that. Take a stab at attaining sustainable development goals and meet brilliant individuals who share the same passion for innovation and people as much as you do! In a short span of five months and as part of a fully funded trip to Norway, you will be able to establish your own startup and receive support from a whole network of talents and mentors. Their well-crafted programs place a heavy premium on creativity, teamwork and leadership, leading participants to pioneer many original ideas and prototypes, such as making affordable biodegradable water filters to providing real time health data—and that could be you! Participants who are interested to find out more about women-centric social causes may find Laina Greene, a businesswoman who champions that as a proud co-founder of ‘Angels of Impact’, particularly interesting. True to their namesake, her business strives to be a “platform for angels investors and corporates who can help fund these social enterprises, buy these responsibly produced goods and help with capacity building or opening doors for them to grow and succeed”. With everyone on board harbouring such a vested interest in empowering women, they aim to work towards the goal of alleviating poverty in Asia and eventually the world. You can’t say you’re too young to do something if Scot Frank started his first company when he was still in middle school. Since childhood, Scot has always harbored a deep passion for using technology to drive social and environmental change. Today, he has been listed by Forbes as a 30 Under 30 Entrepreneur and named an Asia 21 Young Leader alongside many notable achievements. As the founder of One Earth Designs, he aims to change the way people around the world use energy, and continues to seek out every opportunity to learn more about the world and build empathy between people. When he’s not working at the bank, Neal Cross is living in the Sumatran jungle on the weekends. As the Managing Director and Chief Innovation Officer of DBS Bank and the Founder of Hotel Orangutan, a social enterprise to help save the critically endangered Sumatran Orangutan, he helps to give local villagers employment and education opportunities. 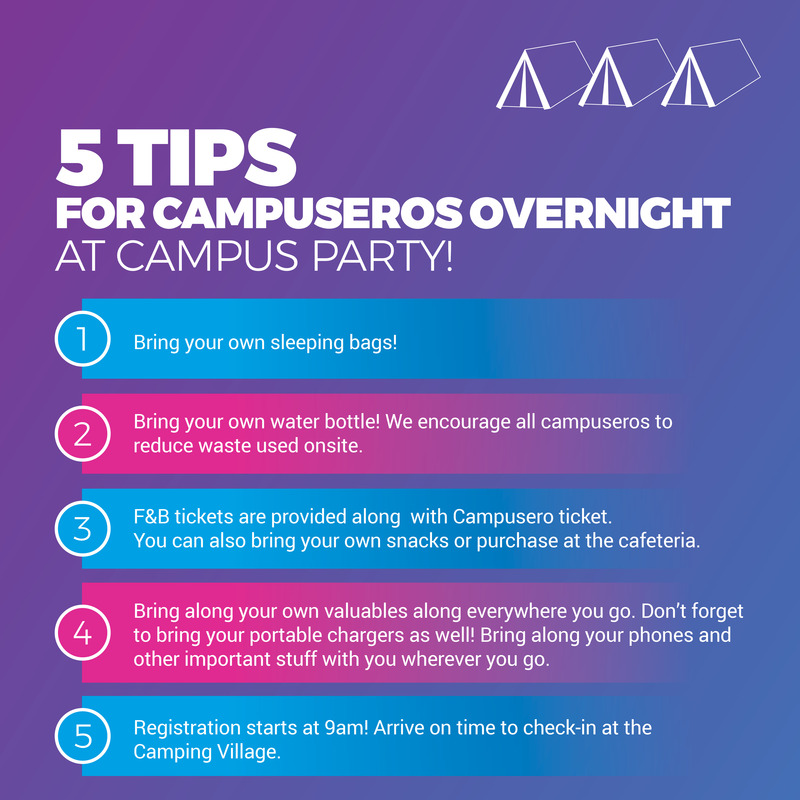 Campus Party Village, a uniquely designed camp site to rest, re-charge and build upon informal collaborative opportunities through eating, learning and sleeping with participants from all walks of life. 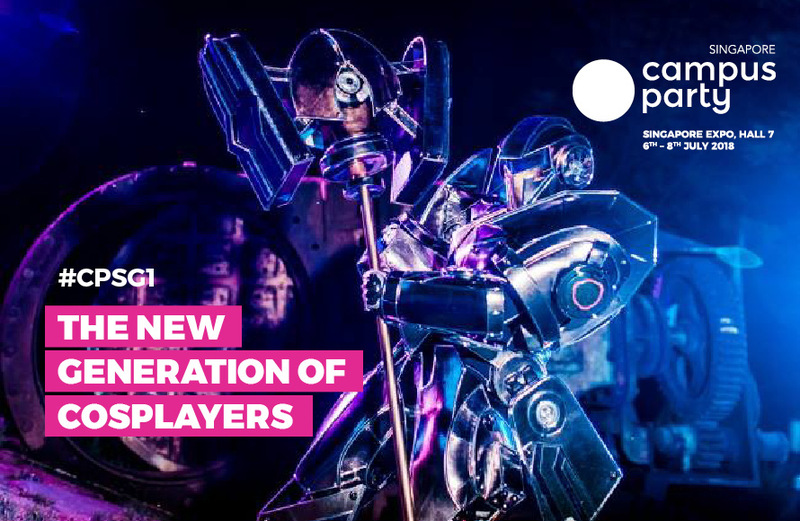 Don’t forget to sign up at https://singapore.campus-party.org/. This is definitely one event you wouldn’t want to miss! Follow our various social media handles on to stay updated and receive exciting sneak peeks. 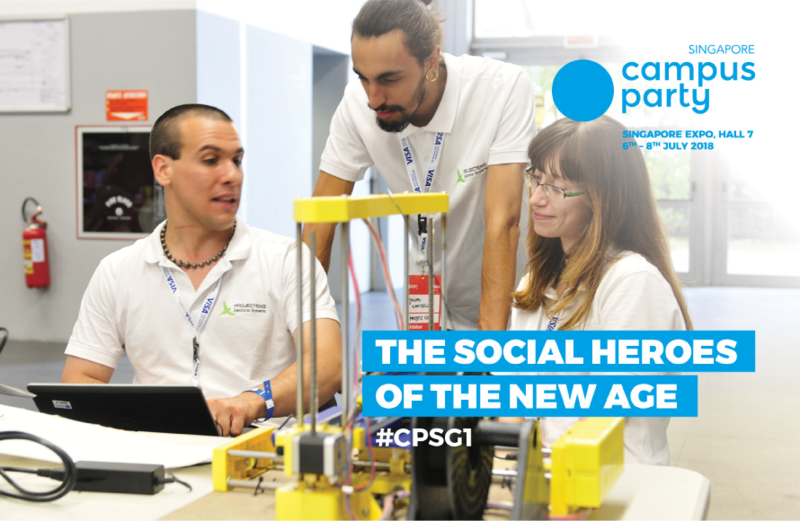 Whether you’re a self-professed tech geek or a newbie to the industry, Campus Party definitely has something to offer!